A Hampshire centre for adults with learning difficulties will receive a financial boost thanks to the support of property professionals in and around Portsmouth. Around £5,000 was set to be raised by Portsmouth Property Association (PPA), which has a record 150 members, including estate, lettings and property management agents, commercial property agents, chartered surveyors, developers, accountants, solicitors and bankers. The fundraising highlight was the annual charity dinner held by the PPA at the city’s The Royal Maritime Club, with 230 guests attending. Monies from a grand auction and raffle will go to New Blendworth Centre in Horndean – the charity is the one chosen by PPA Steve Cripps and provides work placements in horticulture. Steve, who works for NatWest in Fareham as the SME relationship manager, is the first high street banker to hold the position of PPA chairman since the organisation was formed 96 years ago. He is to be chairman for a second consecutive year. The event was sponsored by Portsmouth legal firm Verisona Law and The News in Portsmouth, with the city’s Lord Mayor, Councillor Frank Jonas, a top-table guest. PPA made a £250 donation to his charity fund. Also backing the evening were Chandler Hawkins, NatWest, Clive Emson Auctioneers, Biscoes and Nesbits. Guest speaker Geoff Miller OBE, who played 34 test matches and 25 one-day internationals for England before becoming National Selector for the England team from 2008 to 2013, brought the house down with humorous stories about his professional career. In one anecdote, he recalled how his own father, fearing for Geoff’s safety, admitted shutting his eyes in terror as he watched his son at home on TV face a near-100mph ball in the then-youngster’s Test batting debut for England against the West Indies in August 1976. “It must be hereditary,” joked Geoff, to gales of laughter. The grand auction, carried out by auctioneer and keen PPA supporter Clive Emson, the founder and chairman of regional land and property auctioneers Clive Emson, raised £2,140. One of the nine lots, donated by the PPA, for a petrol-head ride in a super-car, attracted the highest bid of the night at £340. Other lots, from signed soccer memorabilia to a tour and Champagne lunch at the Royal Albert Hall in London, were donated by the PPA, Ralph Evans of Hayling Island, Tigertiger, Property Search Group, Rob Paul Studios and The News. Further money was raised with the raffle following prize donations by QualitySolicitors Large & Gibson, Glanvilles, Clive Emson, Cheese & Cheers, Tigertiger, Roko health clubs, Oonasdivers (specialist diving holidays), Lloyds Bank, Pearsons, Belcher Frost, Chandler Hawkins and Fairhalls. The annual charity dinner took place on Friday evening. A Hampshire centre for people with learning difficulties is set to benefit by thousands of pounds from the Annual Charity Dinner being held by the Portsmouth Property Association (PPA). Around 235 members and guests are expected at the venue – the former Royal Navy Sailors Association Club in Queen Street – to boost funds for the New Blendworth Centre in Horndean through a grand auction and raffle. The PPA has raised more than £75,000 for charity over the last 10 years. The event, sponsored by Portsmouth legal firm Verisona Law and the Portsmouth News, will be attended by the city’s Lord Mayor, Councillor Frank Jonas. The PPA will make a £250 donation to his charity fund. Also backing the event are Chandler Hawkins, NatWest, Clive Emson Auctioneers, Biscoes and Nesbits. PPA chairman Steve Cripps, who is set to stay at the helm of the organisation for a second year, nominated the New Blendworth Centre as the chosen charity for his year-long tenure. Fareham born and bred Steve, SME Relationship Manager at the town’s NatWest Bank and the first high street banker to chair the PPA in its near 100-year history, said: “The centre has created an environment for adults with learning disabilities by providing work placements in a horticultural environment. Steve added: “We have all gone through some very challenging times in recent years there now seems to be an air of confidence around us all. Citing examples such as the success of the Americas Cup last year, development of the base for new aircraft carriers and the Northern Quarter project being back on the agenda, he said: “An economic upturn is certainly here. The future seems buoyant for our area, but we must remember we all have a part to play in the regeneration of the city. Guest speaker Geoff Miller OBE played 34 test matches and 25 one day internationals for England before becoming National Selector for the England team in 2008. The Chesterfield born off spin bowler and lower middle order batsman made his debut in 1973 and captained Derbyshire before moving to Essex, scoring an impressive 14,000 runs and taking more than 1,000 first class wickets.. Respected raconteur, the knowledgeable and self-deprecating Geoff is also said by cricket pundit Simon Hughes to be the ‘last man to field at slip with a whoopee cushion up his jumper’. The auction will be carried out by keen PPA supporter Clive Emson, of Clive Emson Auctioneers, who will be travelling from his home in Kent to bring the gavel down on a series of exciting lots, including signed 1968 Manchester United v Benfica European Cup Final memorabilia, signed and framed 1980 West Ham Utd FA Cup Final memorabilia, a motor racing experience and a pamper day. An original match-day programme and rosette from the 1966 World Cup Final went for £600 at last year’s event, featuring hilarious tales from the green baize by former snooker world champion Dennis Taylor. That night raised more than £8,000 for Ickle Pickles, the charity that helps fund specialised equipment, such as incubators and ventilators, for premature babies in intensive care neonatal units. 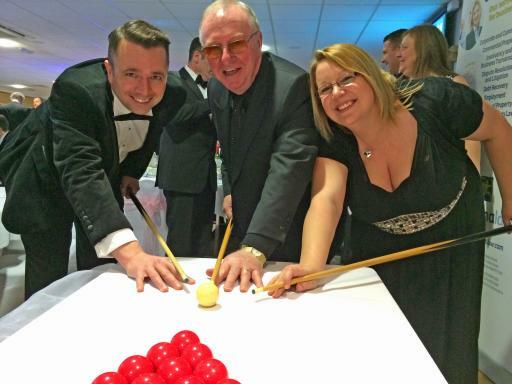 The charity was the choice of 2014/15 PPA chairman Danny Smith, founder of Southsea-based ADN Financial Solutions. PPA now has a record 150 members, including estate, lettings and property management agents, commercial property agents, chartered surveyors, developers, accountants, solicitors and bankers. The organisation was established in 1920, when King George V reigned, Lloyd George was Prime Minister and the body of The Unknown Warrior from the First World War arrived from France for symbolic burial in Westminster Abbey.